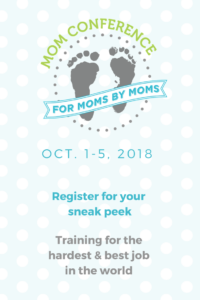 The Mom Conference 2018 is happening next week! I love learning at conferences, but I don’t always get a chance to attend them live in person. Over the last few years, I’ve taken advantage of online conferences, like the Mom Conference. There are always some incredible speakers, and I get a chance to learn from them in my own home. Not only am I looking forward to learning from the speakers at this year’s Mom Conference, I’m so excited and honored to be a speaker myself! The full conference is 27 amazing expert speakers and an absolute TON of useful resources you can start using immediately to reduce overwhelm, get a handle on technology in your home, and connect with your kids on a deeper level so you can be the Mom you want to be. Find out more about The Mom Conference here. I have your FREE Sneak Peek Pass to 8 of these great speakers. Click here to register and you'll receive two keynote presentations via e-mail each day October 1-5 and have 48 hours to view them and soak up all the great info for FREE! My talk is going to be part of day 4, where the focus is Parenting a Child with Challenges.